Lately I have been on a mission to find toddler friendly experiences in Los Angeles which are not only fun but offer some type of sensory development for my 19 month old son, Aiden. After doing some research and asking some mama friends, I visited several places and decided on my top 5 favorites that every mama in LA should know about and visit! Where else can you fly an airplane, jump into a ball pit, stroll through a market to buy pretend groceries with mini shopping carts, climb aboard a fire truck, read stories in a tree house, play with cows in a pasture, take your first art class, or play in a cafe? If you have not been to Zimmer Museum on Wilshire Blvd you must visit it soon! Hurry because they will be closing this location in preparation for a new location in Santa Monica very soon. Zimmer museum offers a variety of classes for all ages, from baby to pre-school! I highly recommend the Messy Masterpiece class where your toddler can explore the texture of paint and get messy in their diapers while creating their first masterpiece you can take home with you! Visit Noah's Ark at the Skirball Cultural center and you are able to go on a magical journey with your toddler, where it feels like you have immersed yourself in a classic story and all the wonders of an Ark. Play, climb, build, explore, make believe, and bring to life all the wonders in your mind! And if that doesn't sound amazing - here is a secret tip for all you mamams: Noah’s Ark tickets are FREE on Thursdays! But they are first-come, first-serve so get there early! Tickets are available at the admissions desk starting at 11:45 a.m. Be sure to bring your own lunch so you can enjoy a picnic in one of the several beautiful outdoor locations at the center! They also offer a variety of special sessions during the week including a Sensory Friendly Friday where you are invited to enjoy a Noah’s Ark experience specially designed for guests with Autism Spectrum Disorders (ASD), sensory processing differences, and other developmental disabilities. Aiden especially loved climbing the rafters of the boat. He found this challenging and it was fun to watch him overcome his fears as he walked over the bridge which moved as you walked. Just read the intro on the Candytopia website and you will understand why this is on my list! "What if an eccentric chocolatier and a daredevil pop star had a whirlwind romance, got married while skydiving, and had a glamorous, glittering love child who grew up to rule a small nation? Welcome to Candytopia, where colossal candyfloss constructions meld with a tantalizing taffy twistedness!" 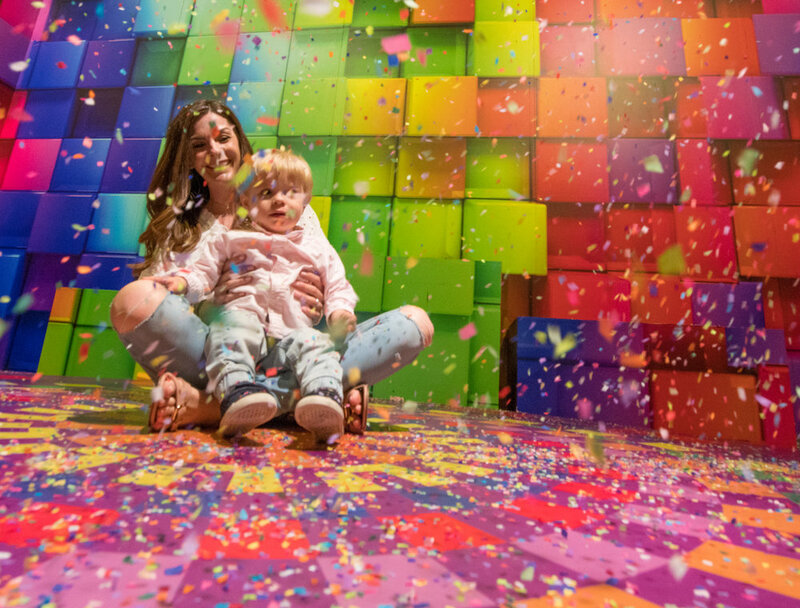 When you enter Candytopia you will walk through a world which feels like you have entered a game of Candyland. There is art candy paintings, an under water candy world, a library filled with candy mystery novels, confetti fairy dusts and my ultimate favorite - a sweet marshmallow pit for you to dive into! And did I mention that every room actually offers you FREE candy to munch on? Yes mamas, be sure to keep an eye on the candy intake (for you and your little one)! "Every child deserves a chance to play!" This is the motto of the founders of Shane's Inspiration foundation and creators of playgrounds like Aidan's place in West Los Angeles. Catherine Curry-Williams and Scott Williams gave birth to Shane Alexander in December of 1995. He was 7 pounds of perfection, except that he could not move or breathe on his own. Diagnosed with Spinal Muscular Atrophy, a genetic disorder afflicting one in 10,000 children, Shane lived only two weeks. In his short life, Shane inspired his parents, family and friends to reach farther than they ever had before and build a Universally Accessible Playground that would allow children to play no matter their age or disability. I love this playground not only because of the name but because of what it stands for. Children learn a lot on the playground and should be given the chance to play no matter what! They also offer programs like "Together We Are Able" a social inclusion education program which is aimed at reducing bias and bullying towards children with disabilities. Please be sure to call me for a mama play date when you are ready to discover this awesome playground! Aiden enjoying the climbing section of Aidan's place, with his trucks of course! When we decided to enroll Aiden in swim lessons, the first reason was because we saw how much he loved water. But the obvious second reason, was that we wanted him to learn life saving techniques, especially since we live in an environment where pools and ocean are abundant. We started mommy and me swim class at Lenny K Swim Academy when Aiden was only 5 months old! Now that he is almost 20 months old, I am in awe of all the development which has transpired on so many levels. Walking across the bridge requires so much trust! The awareness of danger was one of the most vivid memories so far. I can recall the day that he realized that there is actually danger in the water and that he has the power to keep himself safe from harm. He was so proud of himself for knowing his limits and that he can reach for safety on his own. And I was proud of myself for not interfering and allowing him to find his own way. Which brings me to the next important skill you will learn from the class: trust! Trust as a parent to let go, trust for the child with themselves and trust between the instructor the child and the parent! There was one moment in particular that my trust was shaken. He was learning to walk across the raft in the water and he walked off the side. It felt like it took me several minutes to reach him and pull him above water. My heart was pounding so hard but Aiden came out of the water laughing. This small investment has proven to be rewarding beyond his safety but for his overall sensory development. And the instructors are great! One of our early swim classes where Aiden was learning how to float on his own. A moment of trust for both mommy and Aiden! So mamas, what would you add to the list of top LA sensory experiences for toddlers? Leave your comments! And if you live in the area and are interested in a mommy me play date - contact me!